Anise is dried spices. It is a major spice in garam masala. This spice is widely used in cuisine of southern India. 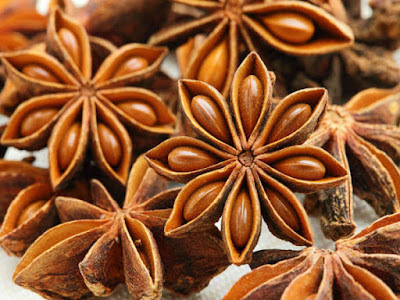 Star anise has such elements that beat bacteria, yeast and fungus etc. People use star anise in flu because it contains such acid which promotes the body’s immune system. Improve Digestion: Star anise is good for infants and adults’ stomach. It gives relief in bowel problems such as pain and flatulence in children and in adult’s indigestion, vomiting, swelling. It relives pain of stomach. For New Mothers: Anise seeds are used for breastfeeding women. Antiseptic Properties: Anise oil has antiseptic properties therefore; it is used to heal the pain and wound. Oral Health: This spice is useful to prevent mouth odor. Anise tea can become a very good mouth wash and it destroys bacteria from the mouth. Aromatherapy: Body and mind become fresh from the inside by anise aromatic oil. Therefore, it is used for aromatherapy. It is used in aromatherapy to cure anxiety, depression, menopausal problems, cough and bronchitis.